I’ve landed, phase 1 complete. I successfully left Heathrow, had a quick stopover in Dubai and made my way to the Bangkok Centre Hotel (yes I cheated – I got a taxi). If you plan to stay here don’t be lame like me, jump on the train, the hotel’s right next to the MRT station. 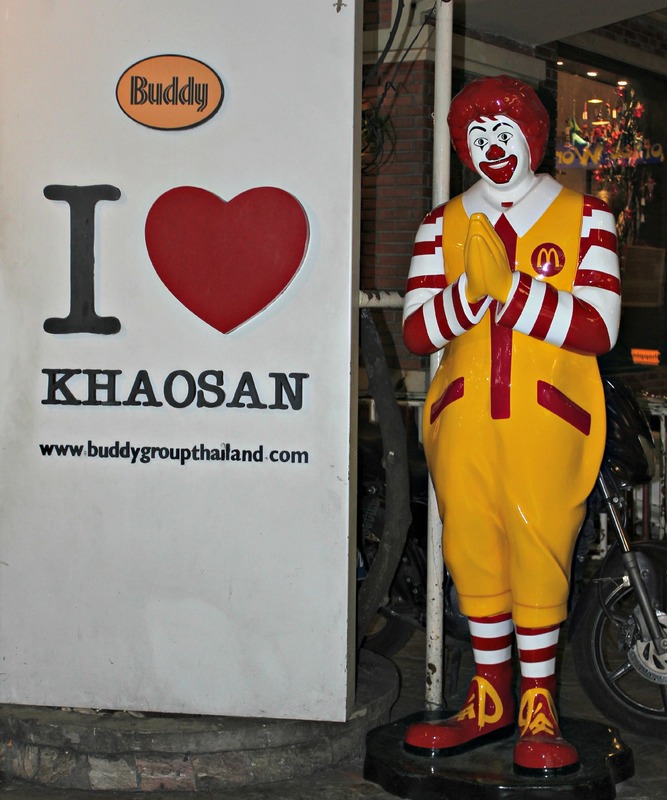 So where to head to… well I obviously asked the masses and a number of friends said the Khoa San Road. I headed there and it was everything I imagined it to be… boozed up brits, fast food, bright lights and cheap clothes. I’ll let you decide if that’s your thing, but it probably is a must see if you come here. I nearly bought a Lonely Planet guide for Vietnam but when I took off the cellophane wrapper it was a badly photocopied version inside a genuine looking cover. The people are so lovely and had no issue with me returning it. These last few weeks I’ve said a constant stream of goodbyes. I close my eyes and I visualise me on a spinning wheel, looking like a mannequin with one arm raised. Like a mannequin I’m mostly emotionless, not because I don’t care but it’s easier to put the steel shutters up. I’ve never flinched at goodbyes before, part from finding them a little awkward. I’ve consoled myself with the fact that I’ll see them again if I want to. These goodbyes feel different and maybe that’s because this time it’s me that’s stepping out into the unknown. Over the last year or so I’ve said two incredibly painful goodbyes, but both were deaths. This time it’s been a conscious choice to pick myself up, take a long hard look at myself and my life and time to start living again. I made the decision to listen to what I wanted to do and that’s to see the world. I’ve dabbled as most people have and been lucky enough to see some beautiful countries but always felt cheated when it’s time to come home. It’s not that I don’t have a lot here, I really do and now that I’m leaving I can really recognise this. But and this is a big but, something is definitely missing. I’ve always felt it… like I’m supposed to be somewhere else. Or maybe it’s all right here, under my nose but I just can’t see it. Either way it’s time to find out. It’s now days rather than weeks before I put my rucksack on and head into the big wide world. It’s goodbye to this life for the foreseeable future. I try and act tough but there are few more goodbyes still to come before I jump on that plane and I’m pretty sure those tears will be flowing.